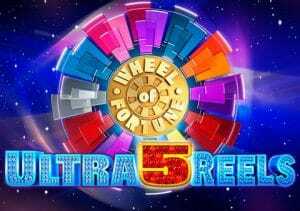 Wheel of Fortune Ultra 5 Reels is a 5 reel, 30 payline video slot from IGT. Available across all compatible devices, you can spin away from 50p to £500 per spin. Another Wheel of Fortune themed offering, this game has a classic, land-based feel with all the glitz and glamour of a Las Vegas casino. The first thing to take note of are the graphics – the reels look 3D (known as stepper-style) and features glitter covered fruit symbols with berries, cherries, oranges and pears. There are also five ‘7’ symbols with the red 7 being the highest value as it rewards you with 400 times your line bet if you manage to get 5 on a payline. However, Wheel of Fortune Ultra 5 Reels is a bounty of multipliers – there’s the Multiplying Wilds feature which is played when the wild (appearing on reels 2 and 4) is part of a payline win. The wild than changes into either a 2x, 3x, 4x or 5x wild. This multiplier value is then applied to your winnings. If you get more than 1 wild multiplier, it may substitute and multiply any payline win up to a whopping 25x! The Scatter Wheels feature is triggered when 3 or more Scatter Wheels scatter symbols appear anywhere in view. Each symbol transforms into a wheel and starts spinning. They will each reveal a cash prize each which are then added together to give you your final prize. The best is the Ultra Wheel Bonus feature which is activated when 3 Ultra Wheel symbols appear simultaneously on the 3 middle reels – you then spin the bonus reels to determine the active wheels. The wheel can appear active, inactive or active with a multiplier value. If 1 or more wheels with multipliers are activated, the corresponding pointer on the multiplier wheel is triggered giving you a multiplier up to 10x. This means that up to 2,000 times your bet can be won on Wheel 1, up to 500 times your bet on Wheel 2 and 100 times your bet on Wheel 3. There is no free spins feature but the 3 features described above more are a good substitute. I love the fact you can win big in both the base game and features – I consider Wheel of Fortune Ultra 5 Reels to be a medium variance game and the best Wheel of Fortune themed video slot to date. If you like video slots with land based origins, you can’t go wrong with IGT’s Cleopatra which is arguably the most popular slot of all time.